Black anodised Giant tubeless spoked wheels are lightweight and strong. The 17" wheels are shod with Continental ContiAttack Supermoto 120/70 and 160/60 tyres front and rear respectively for extraordinarily light handling and exceptional control at all lean angles. Amazing stopping power and control are available at the rider's demand thanks to the radially mounted 4 piston Brembo calliper and floating disc at the front, and the single piston calliper, floating disc at the rear (320 and 240 mm diameters respectively). The latest ABS technology from Bosch guarantees maximum safety and total confidence. Innovative bodywork featuring a long seat that reaches over the radiator shrouds and includes functional ribbing to improve grip in all conditions. Tightly wrapped around the engine and frame, the 701's bodywork is ergonomically designed to connect the rider's body to the bike ensuring perfect harmony between man and machine while allowing for total control in all riding situations. 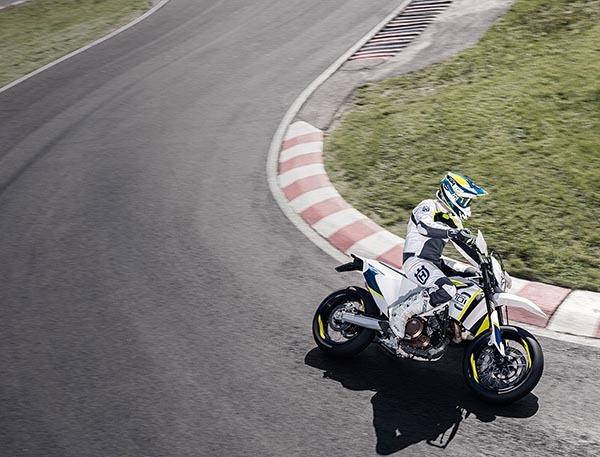 The Husqvarna 701 Supermoto is available to view at our showroom in Tewkesbury. Can’t make it to the showroom? No problem. Give our passionate team a call on +44 (0) 1684 297979 and we’ll give you the full rundown on this beautifully engineered Supermoto machine.